Well, as lawyers put it, the fact-pattern began changing - new leader, new economic strategy, new national self-image - the most sensitive indicator being a big upward twitch in the stock market. The second reason for the change was the new leader himself - Mr. Shinzō Abe - who, the more I observed him, the more I detected someone not cut out of the usual cloth - someone who might actually be one of those rarest of rare birds - a change-agent who actually succeeds. This said, if you follow Japan, I cannot tell you how much skepticism there is about Mr. Abe - from the Japanese especially, but also among us foreigners. The typical onlooker watches him through the eyes of a Greek chorus - now singing his praises as the great magician, now moaning the impending doom of his too-ambitious policies. Greek choruses may blow hot and cold with the wind but they're not stupid. 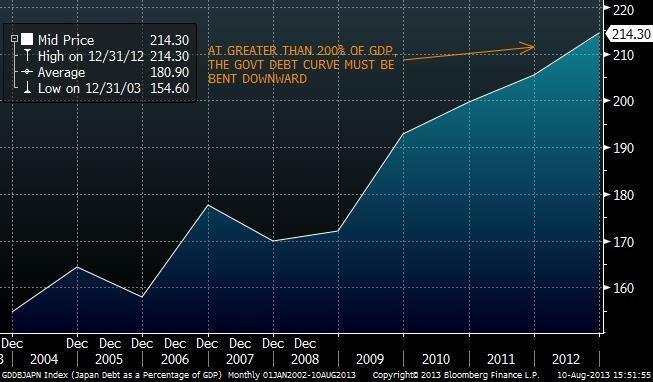 a problem with Japan's government debt being over 200% of GDP. Still, odds rising from 10% to >50% is no small deal and if, like us, you're in the dual business not only of putting your head down close to the ground sniffing out great individual investment opportunities but also standing up and gazing at the horizon to gauge the oncoming macro weather - Japan's possible rise out of its Great National Slump is one of those potentially unusual situations where macro and micro align - a big macro deal on the horizon plus a source of nose-to-the-ground investment opportunities. Which is why Japan calls out to be investigated and invested in. In a world with few potentially big macro events, something big appears to be going on with the world's third largest economy. Japan appears to be... on the move. Four months after his election, Mr. Abe had installed Mr. Kuroda as his new central bank governor - quick work for Japan. Mr. Kuroda had an instant new policy - quantitative easing; a quantitative target - doubling the monetary base by the end of 2014.
and an inflation goal - moving Japan out of deflation into the realm of 2% inflation. Mr. Kuroda moved very conservative central bank policy-makers to embrace his strategy. And confirmatory evidence appeared. Inflation has risen (the orange line in the chart below). The 10-year bond (the white line) after rising initially, has retreated. 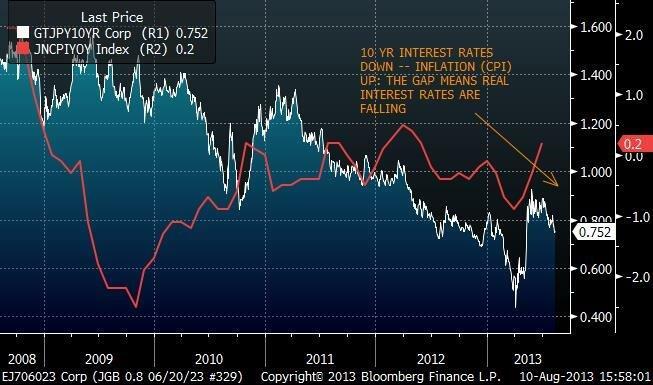 And the gap between the two - real interest rates - is closing - meaning that investors in Japan are getting less interest after inflation. Good for internal growth but also good for a weaker currency. That's the second leg. Quantitative easing plus declining real rates are weakening the yen against the dollar (and other major currencies) and, initially, promoting exports while, eventually, drawing Japanese capital out of Japan for investment overseas. And a weakening yen is not just a positive for Japanese exports but a negative - little appreciated heretofore - for US, European, Korean, Chinese and other currency-area companies that compete head on with Japan. See Chart 3 where the rising line means a weakening yen - i.e. 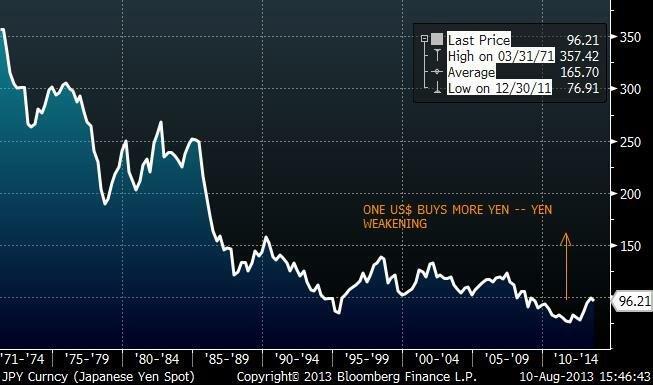 more yen buyable by a US dollar. 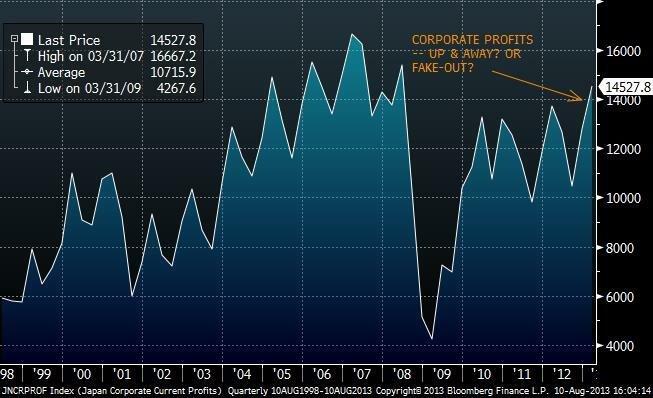 This has translated into recent strong GDP growth. Q1 GDP was up 4.1%; Q2 GDP is expected to be up about 3%, compared with ½ of one percent per year over the past 18 years! Japan merchandise trade exports are ticking are up ~10%. Consumption is rising, though to some degree in anticipation of a consumption tax in April 2014. Business confidence across all businesses and industries has ticked up from negative and close to neutral territory. Improvements in the private economy have been helped by an increased rate of public works spending rising about 25% year-over-year in May. The Nikkei 225 is up 33% from about 10,395 at the end of 2012 to 13,825 on August 7. A very good move which has included a major correction since May 22 when it was 15,627. But this upward move in a long-term context - since 1950 and especially since 1990 - is still relatively small and we still have yet to see the announced involvement of large Japanese pension funds in the stock market. There's a big debate as to whether Mr. Abe is being too nationalistic and bellicose - rebuffing China's claim over the Senkaku Islands; increasing military spending; talking up a proactive Pacific Rim foreign-policy alliance; and suggesting changes to the Japanese Constitution to recognize the reality that it has a right to have a normal military. It's hard to know for sure, though my sense is that Abe is a careful operator - evidenced by the fact that since his July 21 Upper House election win, he has put constitutional change regarding the military behind his number-one priority of getting the economy going. But what I really think is important here is that Abe's nationalism - in its moderate form - is giving Japan a new sense of identity, purpose and pride and, in that sense, is an adjunct (intended or not) to his economic policy. Mr. Abe's strategy is based on his so-called 3 arrows: fiscal reform starting with spending on public works; monetary reform - bringing the inflation rate from negative to positive 2%; and a series of fundamental reforms first enunciated on June 14, 2013. While the Japanese and foreign investors are holding their breath, wondering whether Mr. Abe will really make good on his "third arrow" of economic policy, the good news is: he has a policy. And he has enunciated that policy in a remarkably straightforward, no-nonsense way on a LinkedIn posting on June 30). He wants to lower corporate taxes. He wants to create tax-free enterprise zones in Japan. He wants to break the glass ceiling and get more women into the economy - an important potential offset to Japan's lack of immigration and declining population. And he has just become the 12th country, announcing his intention (on July 23), to join the Trans-Pacific Partnership (TPP) trade talks - a plan for a free-trade zone with eleven other countries which will require Japan to make a number of foreign-trade concessions that will liberalize its domestic economy. Finally, with Abe's election last December 26, 2012 and his winning the upper house on July 21, 2013, the LDP and its coalition partner have gained 3 years of majority control - a major step considering that there has been one Prime Minister per year since 2006! This will allow the Diet, which will meet in October, to discuss seriously the passage of the first reform proposals that Abe has enunciated. Will it all come together? There are certainly obstacles ahead. Or will he come up with a compromise that retains his debt-reducing bona fides? Near-term, if Mr. Abe is really serious about bending Japan's large government debt to GDP, will he go ahead with the scheduled rise in the consumption (VAT) tax, now 5%, to 8% in April 2014 and 10% in April 2015? Will he really do the tough part in October and start the reform ball rolling? It's hard to reform when affected constituencies rise up against you. Look at our own country. And then there are the Japanese themselves. There's a lot of skepticism. Eighteen years of deflation is hard to overcome. Eighteen years of false political starts. I don't blame the skeptics. I think there's a real chance that Japan shakes off the past. A real chance that Mr. Abe is the change agent he appears to be. And I say this for two basic reasons. First, the change that Mr. Abe has been elected on was supported by two very strong electoral victories and no big opposition since. Second, the Japanese, as a people, have proven they will make sacrifices when it's required. This combination of factors - plus the facts I've laid out - augurs for something on the brighter rather than on the darker side. Still, the doubts that abound are reflected in the Japanese stock market which is the most volatile I have experienced. I think those doubts and volatility will remain until people see that Japan really is migrating, like the flock in the initial picture, to a better place. In the meantime, next time you're bored with investing, look East - Far East. You will now receive email update when a new UNIO Blog has been posted. Please confirm your subscription by logging into your email client.